You think you don't need to study anymore after graduating from college? Of course No! Continuous education is a must in order to improve one's self. The moment I knew that I was pregnant last 2012, fear of the unknown got into me especially because I was a first time mom. I was overly stressed with so many things. I had lots of questions in mind, lots of decisions to make, lots of preparations to do, even finding a good OB was my initial concern. Luckily, there are lots of seminars for us to attend and be informed nowadays. It's a mom's responsibility to prepare for the coming of her baby. It pays to be prepared. 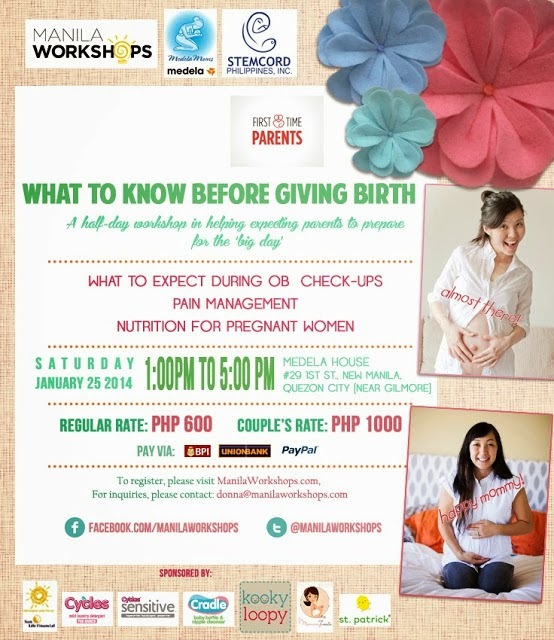 This coming Saturday, Jan. 25, 2014, there will be a talk about What To Know Before Giving Birth organized by Manila Workshops in partnership with Medela Moms, Inc. and co-presented by Stemcord Philippines, Inc. This will be their first workshop for 2014 under the First Time Parents (FTP) Series which aims to help first time parents or even experienced-but-need-refreshers parents be equipped with topics on Pre-Birth, Delivery, Newborn Care and Toddler Care and of course Breastfeeding. Succeeding workshops will be announced separately. What To Know Before Giving Birth will be a 4-hour workshop running from 1:00 to 5:00 in the afternoon to be conducted at the Medela House with address at #29 First Street, New Manila, Quezon City (between Gilmore Street and Robinson's Magnolia). There will be two speakers for the said workshop. 1. Dr. Diana Liu-Sarmiento, MD, Obstetrics and Gynecology practicing at the Asian Hospital. - She is a graduate of the University of Santo Tomas Faculty of Medicine and Surgery. - She completed her internship and residency training in Obstetrics and Gynecology at the UP-PGH and proceeded with her fellowship in Trophoblastic Diseases also at UP-PGH. - She is a consultant at the Asian Hospital Medical Center. - She is a writer for the Women’s Health and Wellness section of Yahoo! South East Asia. You may visit her website for helpful information pertaining to Women’s health and pregnancy with an online question-and-answer section called Magtanong Kay Doc. - She is a registered nutritionist-dietitian and a full-time faculty at the College of Home Economics, University of the Philippines-Diliman. - She has been teaching Principles of Nutrition, Nutrition for the Lifecycle, and Medical Nutrition Therapy for the past 12 years. - She has published scientific articles on glycemic index, essential fatty acids for brain development, and clinical nutrition. - In 2005, the Nutritionists-Dietitians’ Association of the Philippines awarded her as The Most Promising Nutritionist-Dietitian. - She is happily married for 9 years and a mother to their son, Gabby. Should you be interested to attend, kindly click here to register. Learning fee for individual is P600 while couple fee is P1,000. 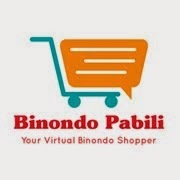 Payment mode is via BPI, Unionbank or Paypal. Manila Workshops is encouraging everyone to register and pay till Jan. 22 (Wed) so that you can have the Manila Workshops Learning Circle Card. Good news! Because you have read this event invite from my blog, I will be giving away free seats for three (3) interested couples. Just simply follow the Rafflecopter below. This will only run for a day and will end by 11:55pm of Jan. 22 as I need to submit the names by Jan. 23 to the organizers. Hope you understand. So help me invite your first time parent friends, pregnant friends, or planning to get pregnant friends. Thank you!